One, two; one, two… Is this thing on? Muhammad would never have said “Surely you agree THAT is a step forward?” The Qur’an states unequivocably that Jesus was not crucified, and that someone else was killed in his place … “[The Jews] denied the truth and uttered a monstrous falsehood against Mary. 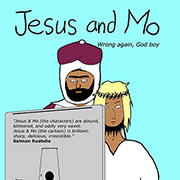 They declared, ‘We have put to death the Messiah, Jesus son of Mary, the apostle of Allah.’ They did not kill him, nor did they crucify him, but they thought they did (literally ‘he was made to resemble another for them’).” (Surah 4:157) It might be a good idea for future cartoons if the cartoonist actually read the Qur’an.